Not long after Gamasutra published the piece, Civilization co-creator Bruce Shelley — who was a great resource in creating the article — sent me a list of comments and clarifications about it via email. Shelley was at Ensemble Studios at the time. Bruce’s comments weigh heavily on my mind whenever the article comes up again. Re-reading them, I now see that most of them are not major issues, but I figured it was time to finally publish his comments in case they are helpful to future students of my work. Here are some comments on the piece. Some deal with things I think are a little off, while others are just more background. I don’t think it matters if you make any changes, although some people are getting more or no credit than they deserve. The idea of the ‘Meier-Shelley process’ is a little strong. ‘Meier process’ is probably better, though we used it in the board game business forever. At ES I call it ‘Design by Playing’ and will actually be giving a speech about it in Germany next month. Page 1: I don’t think Bill was ever a fighter pilot. I believe he flew transports. We had a friend of Bill’s from the Air Force Academy work as a consultant. He was a real F-15 pilot. First name was George but don’t remember his last. I think he pooh-poohed the idea that Bill ever flew fighters, though he certainly wanted to. Page 1: Bill and Sid were at a conference or something where there was a WW I flying game in an arcade. They played the game with Bill expecting to be much better than Sid, but Sid quickly understood the game’s programming and easily outscored Bill by knowing what the game was doing. 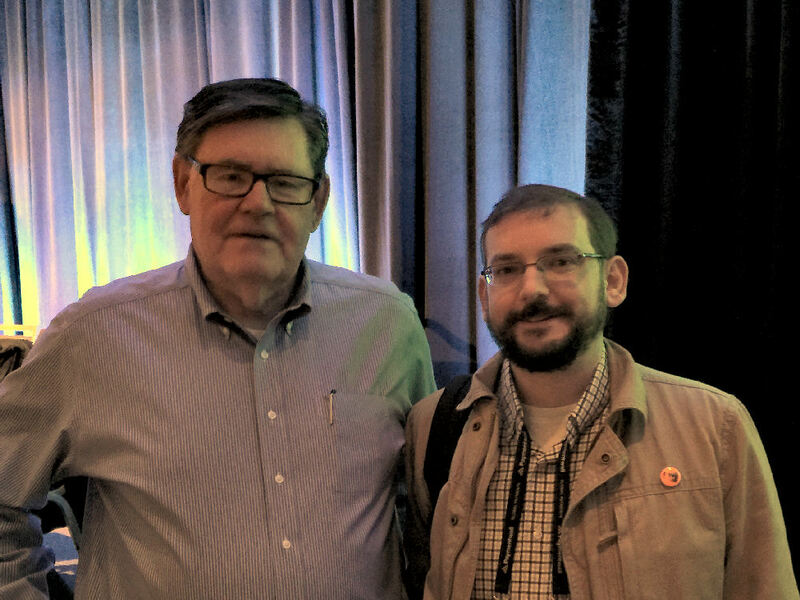 He supposedly told Bill I could write a much better game. Bill supposedly replied that if he did Bill would sell it. For the tenth anniversary of the company some execs located that actual arcade game, bought it, and presented it to Bill and Sid. Page 3: I didn’t convert 1829 into 1830. We asked Francis to make a game about American railroad and he sent us the prototype 1830. We thought it was flawed and would not be popular with US audiences. We went back and forth and finally Francis agreed to let me make a few changes. I made one principal change and I think it was key to the game becoming a big success. I remember playing both 1830 with Sid (several times) and 1829 (once) and he commented on the changes in 1830 being a big improvement. In those days there were designers and developers who polished a board game for publication. Sometimes people did both jobs. For 1830 I was the Avalon Hill developer, not the designer. Page 2: Having already created the genre of flight simulators and submarine simulators, Railroad Tycoon created the tycoon genre. There have dozens and dozens of tycoon games since. I don’t think many people realize how many genres Sid created. One would be enough to make anyone noteworthy, but three or four or more is unprecedented. Page 3: The implication is that only I was playing while Sid wrote code. He played the game a lot himself, maybe as much or more than me. So our discussions were founded on the experience of both of us playing, not just me. I was an alternative, perhaps representing the casual gamers of the world. Page 3: I don’t think Sid kept people from watching but he wouldn’t give anyone else a copy. I remember people coming in to watch me and ask questions. A lot of people were following the game along and liked what they saw. I am sure he was bugged by people wanting to try it. Page 4: I didn’t write all the Civilopedia entries. I remember getting some help from a colleague, Bruce Milligan. I had the manual underway at the time also. Page 4: I don’t think the IPO was a desperate grab for cash. With the gulf war going on the company’s back list of tank and flight simulators starting jumping off the shelves and the balance sheet suddenly looked real healthy. Bill took that opportunity to go public. I don’t recall how much, if any money, went into the company coffers. As I recall the only people to have shares to sell were some venture capitalists who had funded the failed coin-op business and Bill himself. Not a single employee had earned a single share by that point. Bill got something like $38M and no other employee got a dime. We were allowed to buy shares at the offering price. This didn’t sit well with people, especially long time veterans. Then Bill bought everyone in his family big cars, including a big Mercedes and an NSX for himself, which he parked right in front every day. I thought it was ugly. We did it a lot differently at ES. 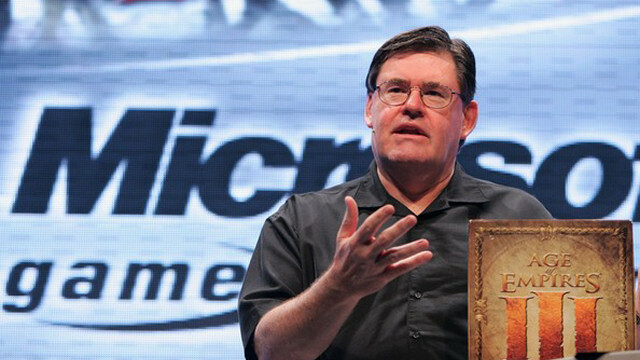 Everyone was a part owner when Microsoft bought us. Page 4: I left Microprose in December of 1992, long before Sid left. I had complained for some time to the VP of development about being the lowest paid designer on the staff but he refused to do anything about it. I had recruited a friend who was paid more than me to start. When my wife was offered a job at three times my salary in Chicago, it was relatively easy for me to walk away. I freelanced strategy guides for two years before joining some old friends to start Ensemble Studios. Page 4: Firaxis was started by Sid, Jeff Briggs, and Brian Reynolds as partners, with Sid the majority partner. Brian and some of his close friends left after a few years to start Big Huge Games, where they continue to work. Page 4: Age of Empires is not my series. The lead designer was Rick Goodman, brother of Studio Head Tony Goodman. I was one of the three designers credited with that game and certainly had an influence on it, but was Rick was the lead. Rick left at the end of the game and started his own studio Stainless Steel in Cambridge, MA. Some of the stuff I mention is probably worth confirming before you publish it. For example, I don’t know the exact details of the IPO. At one time I had a copy of the prospectus that detailed where the shares that made up the offer came from, but I have no idea where that is now. You could find out from others who George was and be certain whether Bill was ever a fighter pilot in the Air Force or Air Force Reserve, or a transport pilot. I have not checked everything Bruce Shelley wrote, so there could be some errors in his recollections. From what I can tell, it looks like Bill Stealey flew fighter training aircraft and also transports in the Air Force. Does that make him a ‘fighter pilot’? I’ll leave that to an Air Force buff to figure out. The other person I wanted to interview for this article was Stealey himself, but I did not have the time to pursue that. I never heard any feedback from Sid Meier about my article. I did email him after it came out, but I figured he might not be too happy about the personal and financial details I divulged in the piece (most of which came from Shelley). Meier struck me as a private fellow. Then again, that’s an assumption too. Luckily, I don’t think Meier remembered the article when I eventually met him in person — almost exactly ten years after our telephone interview. In March of this year, I attended the Game Developers Conference in San Francisco. At the conference, Sid Meier and Bruce Shelley gave a postmortem talk about Civilization. It took place early in the day, and I did not make it in time from my hotel across town to grab a seat at the session — the line was out the door and way down the hall. But after it wrapped up, I went inside the room and lined up to meet Sid and Bruce in person. 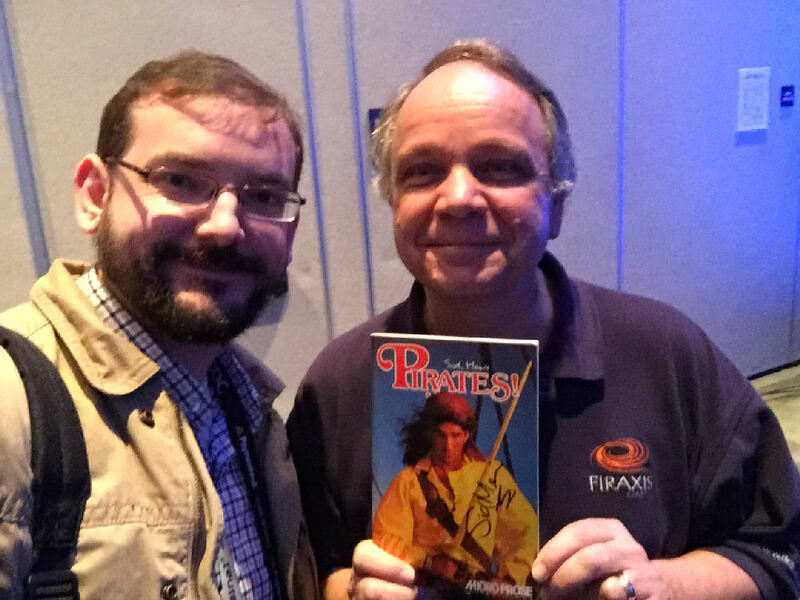 Although I had interviewed Sid Meier over the telephone for the article and had kept in touch with Bruce via email, I had never met them face to face. It was a great honor to meet them and to get Sid to sign my Pirates! manual. And here you can see the photographic evidence — in all its dark and grainy glory. That was a heck of a trip. Finally, in other news: Last month, someone named Han in China asked me if they could translate The History of Civilization to Chinese and publish it on CowLevel.NET. But seriously, it’s not a bad article overall, so I hope they enjoy it. I have finished the translation of your article, and there are the links. I split your article into two parts. The First part is the main article. 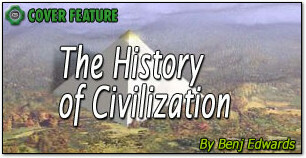 The Second is the interview and timeline of civilization. Thanks for the approval again. 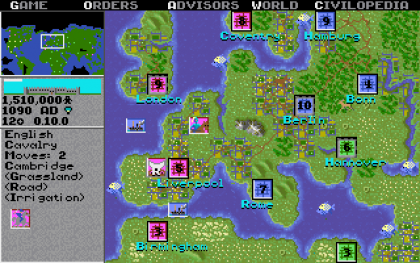 I am very happy that ten years after I wrote my article — and 26 years after the publication of Sid Meier’s Civilization — people are still talking about this incredibly important and influential game. This entry was posted on Tuesday, July 18th, 2017 at 6:00 am	and is filed under Computer Games, Computer History, Gaming History, News & Current Events, Retrogaming, Vintage Computing. You can follow any responses to this entry through the RSS 2.0 feed. You can skip to the end and leave a response. Pinging is currently not allowed.